The working corner consisting of a desk and a chair, now it become an DIY area. 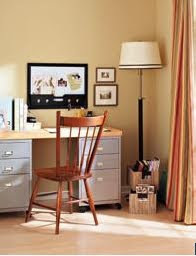 Use two folders to collect those original scattered documents and letters, the dame time place a notice board at the horizontal position in the eye, aside which there is a floor lamp to replace the original table lamp, so it can illuminated the whole region when after dark. Add a piece of carpet to cover the ground, as well as cushions on the sofa, the carpet with plant patterns and those color cushions added vivid colors and soft coziness to the living room, as the bright floor windows reflects windows and the fireplace, all is seemed so dynamic and vibrant. A cloak cabinet has been added into the corridor, which can provide abundant storage space for the family members. From small storage cases to large size storage lockers, the family members can store a variety of items, so they will no longer to have those piecemeal items on the table, and no longer make the space looked in a jumble. After a preliminary rebuilding, we have made full use of the original resources in the living room, at the same time added new colors and patterns, thus solved the problem of absence of storage space for small objects. 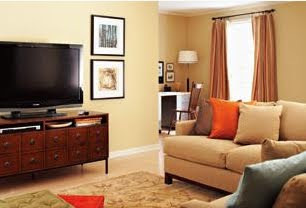 We also have replaced the original old TV, and placed an ultra-thin plasma TV, so the living room looked as a small home theater, is that feeling wonderful?